Prepared and edited by MEHR Research team using best sources from nearly 60 websites and e-books. Finance is a tool of General Management in running a business; however, if is a historic measure of efficiency rather than a proactive business tool, and as such fits into the Internal task Quadrant. General managers, those concerned with directing and developing the strategy of an organization, should be immune from bias towards any particular Quadrant. They should sit squarely in the middle of the Quadrants choosing between them as the situation dictates. 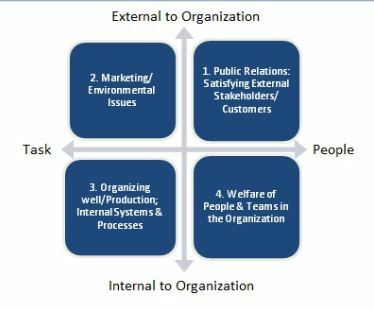 Depending on the type of organization, each of these Quadrants will have different importance. In business, emphasis is usually on the task, more especially on the marketing Quadrant. This can lead to confusion if the strategy just concentrates on this aspect and ignores all the other factors. All Quadrants have to be taken into account in formulating strategy.